Leotronics is a leading supplier of FFC connectors to a wide range of industries within the UK and across the globe. We work with a select few of accredited and internationally-trusted suppliers to source high-quality FFC connectors which coincide with your FFC cable requirements, including 0.5, 1.0, 1.25 and 2.54mm pitch, all available with next day sample delivery and quick turnaround on orders worldwide. 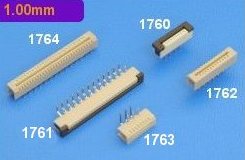 Proud to supply a wide range of high-quality FFC connectors worldwide.